The first in the MAC 2000 series, the MAC 2000 Profile is a high performance lighting tool for touring, theater and special event applications. Based on input from some of the world’s top lighting professionals, the MAC 2000 Series delivers an exceptional combination of extreme power and new projection possibilities. 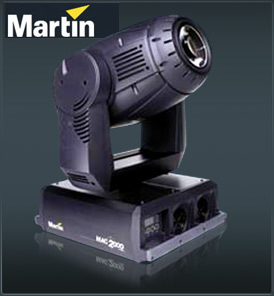 The MAC 2000 delivers intense, pure light output generated from a 1200-watt source. An extraordinary, multi-coated, 10-lens optical system provides sharp contrast and consistent beam field characteristics. Full range zoom-to-focus effects are possible. Two dual rotational and indexible pattern wheels are capable of new and unique effect possibilities. Each wheel houses 5 replaceable pattern effect slots plus open and also features all new gobo designs. A newly designed CMY color-mixing system offers a nearly unlimited variety of color choices. An innovative color temperature correction (CTC) system provides for effective CTC flexibility making it possible to gradually and smoothly increase or decrease color temperature. Variable and smooth dimming, as well as extreme strobe effects are possible via a combined dimmer/shutter. For easy adjustment of beam size as well as beam angle, a motorized zoom with a 10 to 26 degree range is included. The MAC 2000 includes a specially designed flight case of durable, water-repellent ply.